The One That I Want is a romantic comedy written as only the brilliant Jennifer Echols can. Gemma is an exceptional majorette, self-conscious about her weight and struggling with relationships in her life. Meeting Max right before her sophomore year begins seems to be a bright spot in her otherwise cloudy summer, until she discovers he’s going on a date with her best friend, Addison…and she’s going on a date with his best friend, Max. Sounds like soap opera drama, doesn’t it? The One That I Want put me in bright spirits as soon as I started reading. Gemma, Addison, Max and Carter didn’t always get along and their interactions felt really authentic. I couldn’t get enough of Gemma’s humor. I could just picture her delivering the punch lines with the most sarcastic smile. Despite his proven ability to make girls mad at him, Mr. Kichirou Maximilian Hirayama had a way of lightning up the story and causing the cheesiest grins to spread across my face. Max is Japanese and had the cutest way of asking Gemma, “Do I look foreign in this?” I practically swooned every time! High school probably would’ve been a mediocre experience for Gemma had she not found her calling – baton twirling as a majorette. I never had the desire to learn baton or tryout for majorette, but Echols made the sport fun and sassy, not at all like I believed it to be. My first impression of Gemma was that she was a tough girl that didn’t care what anyone thought of her and always stood up for herself. Truly, Gemma hid behind her purple streaked hair and second hand clothing and did things to keep other people happy. She changed so much throughout the story that her conscious efforts were practically tangible. I could feel when Gemma was going to take a stand and take what she wanted. Jennifer Echols has taken a rare situation and turned it into a story brimming with love and big personalities. 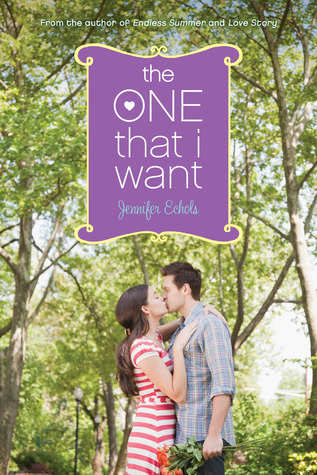 The One That I Want is a fast-paced young adult contemporary romance that will never get old. This book sounds like fun! I don't read a ton of contemps but I like a good one every now and again. Great review!